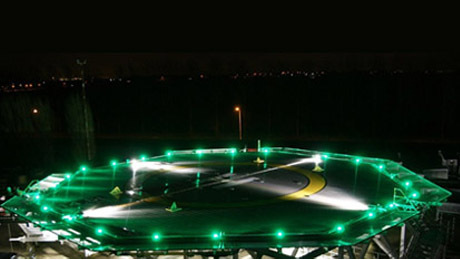 CAA authorities around the world require helidecks and helipads to be lit for night use. Sometimes, lights are switched on even during daytime for better visual cues, especially when the sky is overcast. The lights have followed the usual technology curve in moving from standard GLS lights in the earliest days to compact fluorescent to halogen to xenon discharge to LED. Existing lighting systems require both perimeter lights and floodlights. Both of these are available in both Xenon and LED versions, with perhaps the LED offering better light rendition, longer lamp life and lower power consumption. We are now able to offer this illuminated Circle and H lighting in full accordance with the latest CAP 437 standards including installation of such lighting. 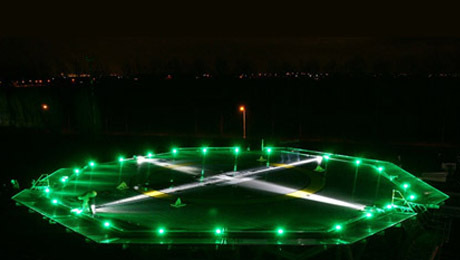 The lights and all components should be durable and tested to withstand 15MT (240lbs/sq inch) helicopter landing loads. 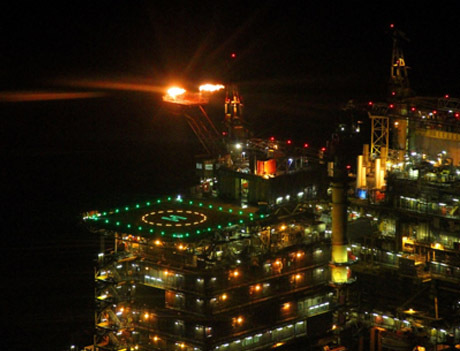 As the new lights are now integrated into the helideck landing surface, it is important to have proper installation methods to ensure the structural and operational integrity of the helideck. Correct installation becomes crucial since the lights are now integrated into the helideck landing surface. We have developed appropriate installation procedures, in conjunction with the lighting manufacturers, to ensure the structural integrity, durability and water-tightness of our helidecks. Stage 2 lighting is therefore a new lighting system component which becomes compulsory for new builds with effect from May 2012 (7th edition CAP437). For existing helidecks, UKCAA considers that a “reasonable time frame for implementation is within three years for at least half of all helidecks being operated… and for all helidecks (within the purview of UKCAA regulations) by 31 Mar 2018”. (UKCAA Safety Regulation Group letter dated 26/02/2013). The advice is that helidecks be prioritized and those regarded as high priority be retrofitted first.